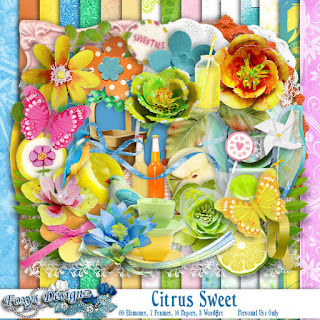 A Gorgeous Foxy’s Designz' Tagger Size Citrus Sweet kit. You can use it for fresh and Spring themes. I made a set consisting of a Profile, and a Timeline. The kit has 69 gorgeous elements, 7 frames, 13 coordinating papers and 3 WordArt. You can request this gorgeous kit at Treasured Scraps at a 50% limited time discounted rate, and at MysticalScraps for another 50% limited time discounted rate. Check out Foxy’s Designz’s blog for the other gorgeous snags and other kits.